Nachshin & Langlois, LLP, is a family law firm located in West Los Angeles, California that offers a highly experienced and qualified staff of California family law attorneys who assist clients with a variety of family law matters. The firm's approach is to focus on the best strategy to resolve and settle family law matters and disputes which could include family law settlement conferences, mediation, arbitration or litigation. The California law firm of Nachshin & Langlois represents many high-net worth, high-profile and celebrated clients in sports, music, film and television, as well as homemakers and business professionals. The firm provides a complete range of family law services addressing matters and disputes involving: divorce/legal separation; child custody; child and spousal support orders and modifications; guardianships; cohabitation; premarital and postnuptial agreements; palimony; paternity; and issues related to domestic partnerships. Senior partners, Robert J. Nachshin and Joseph A. Langlois, are best known for the precedent-setting win in the Barry Bonds’ prenuptial case, in which they prevailed on Bonds’ behalf at the California Supreme Court level. 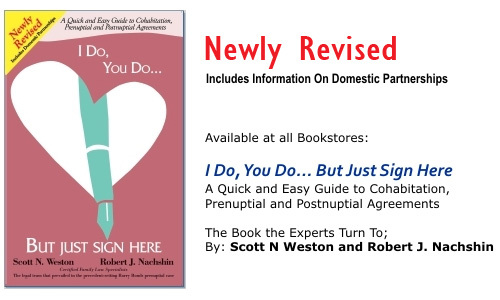 Often seen on television and in print media as an expert family law commentator, Robert Nachshin co-authored a book on cohabitation, prenuptial and postnuptial agreements, I Do, You Do…But Just Sign Here- A Quick and Easy Guide to Cohabitation, Prenuptial and Postnuptial Agreements. The book is available at www.amazon.com and www.barnesandnoble.com and through all major bookstores. A partial list of celebrated personalities on the client list of Nachshin & Langlois include other sports figures such as; Welterweight, Oscar de al Hoya; baseball players Gary Sheffield and Bret Saberhagen, and basketball player Brian Grant. Those in film and television include: screenwriter Terry McMillan (How Stella Got Her Groove Back), producer Don Bellisario, film director, John McTiernan and the ex-wives of John Ritter, Will Smith and Brian de Palma. Those in music include Snoop Dogg, Mel B (Scary Spice - Spice Girls), the late Buck Owens, David Cassidy and the ex-wives of Rod Stewart, Bill Walsh (The Eagles) and Eddie Vedder (Pearl Jam).